As we get closer to the holidays, I’m thinking ahead to the little things I can do to make our guest room more comfortable. 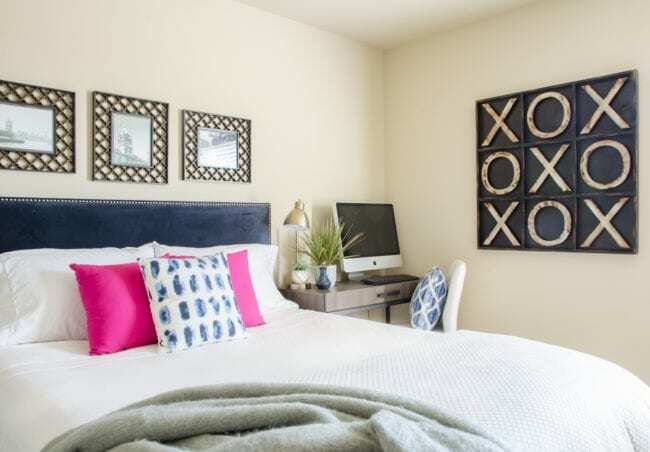 I always feel the pull to do a full makeover to our guest room, but priority-wise, it hasn’t made sense to allocate budget there until we have the rest of the downstairs finished. I recently had the face-palm moment of realizing there were still plenty of fast, fairly inexpensive things I could do to improve the comfort of our guests now. I was able to use almost all items we already owned to make the room more functional AND way more attractive at the same time. 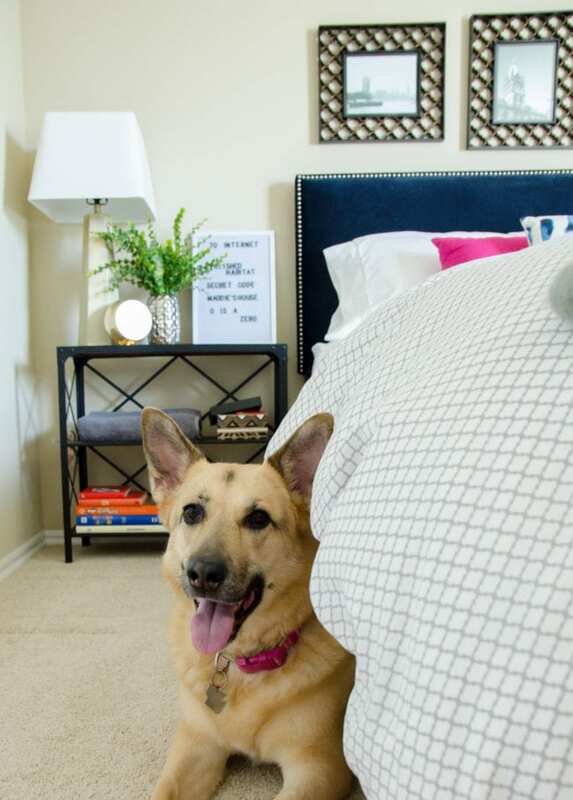 After tackling our guest room, I came up with a list of ten things everyone should consider in their own guest space. PS: Right after the tips, there is a BIG giveaway. Good luck! Declutter – This one should go without saying, but I’ve been guilty before so it had to make the list. 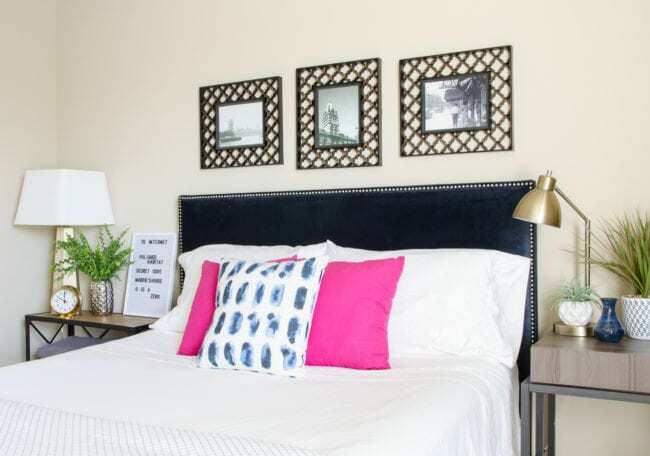 Guest rooms can often end up used as storage, but if possible, any non-essential items should be removed before the guest arrive. In the past, I’ve left extra art leaning up again the wall before, and am wondering why I didn’t just get it outta there. Or even better, use it to decorate the guest room. We hung up the art that used to be above the fireplace and it’s perfect! Temperature Control – One of the worst things about sleeping somewhere else is when you are hot or freezing in the middle of the night. Our house didn’t originally have ceiling fans, and that made for a rough first visit for Corey’s sister. In Oklahoma, we’re all quite-addicted to our ceiling fans. 🙂 If your room doesn’t have a fan, and adding one doesn’t make sense, consider placing a free-standing fan in the closet and let your guest know it’s available. Since our upstairs is on a separate thermostat, we also let everyone know where it is and that they are welcome to adjust it to their comfort level. I also try to keep an extra blanket visible for chilly nights. Consider the Sheets – Speaking of temperature, the best improvement to the guest room this year was switching to sheets made from HygroCotton®. To create HygroCotton, cotton is spun to create a yarn with a hollow core. This means it can regulate temperature to keep things cooler in the summer and warmer in the winter. That’s some serious magic! The proprietary hollow core also wicks moisture. Even better, sheets made from HygroCotton get softer and loftier the more you wash them. I love products that improve over time. In fact, I think I’m stealing these sheets for our room and buying another set for the guest room. 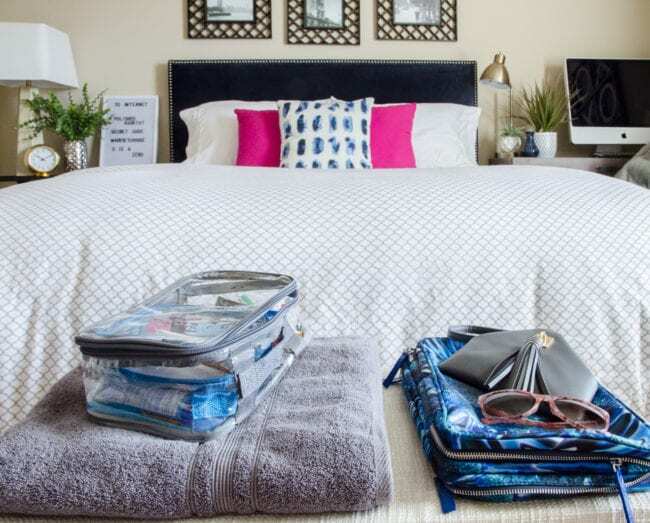 Sheets and towels made from HygroCotton come in wide range of price points and can be found in retailers such as: Bed Bath & Beyond, Costco, Kohls, JC Penney, Walmart, Macy’s , Kmart and Sears. Just look for the word HygroCotton on the packaging next time you are shopping! 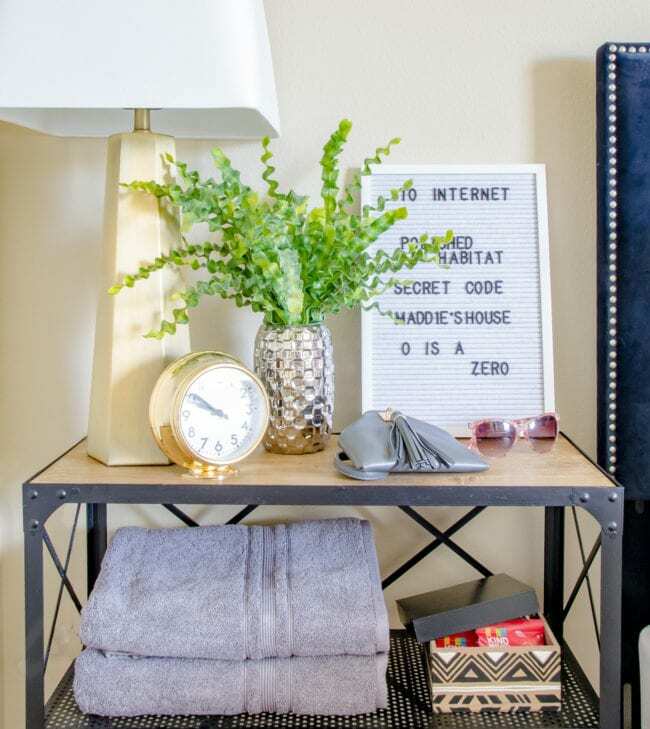 Post the WiFi Network Name & Password – I had a little dry erase board for this before, but swapped it out for a $10 Letterboard I found at a big box store. Now it looks like part of the decor! Outlet Access – People often use their phone as an alarm clock on the nightstand, charging it overnight. I had a frustrating hotel visit with no bedside outlet access this year. It made me realize our guests have had the same frustration in the past. Our wall outlet is hidden behind the bed, so I ordered a couple power strips – one to place on each side of the bed. Pet Awareness – You guys know how much I love Maddie, and if you follow on Instagram, you’ve probably seen her lounging on our bed. She’d happily jump into the guest bed WITH the guests. Despite being a dog-lover, I never assume that someone visiting feels the same way. We add a baby gate across the stairs so Maddie’s access can be easily controlled by our guests to their level of comfort. Bedside Lighting – We’ve had a rotating nightstand & lighting situation in the guest room, but one of my improvements this year was making sure there was lighting on BOTH sides of the bed. I used lamps we already owned, but weren’t really using in their prior locations. Snack Basket – An uncomfortable temperature is probably the #1 cause of guest discomfort, but suddenly being hungry once everyone else has gone to bed isn’t the best scenario either. A simple container of snacks shows some added love and will hold your company over until breakfast. On a related note, if you aren’t coffee drinkers, but your visitors are, consider adding a small coffee station in the guest room. Beyond the Bedroom – While I was updating the sheets, it was the perfect time to check out HygroCotton towels as well. The same technology that makes the sheets moisture-wicking makes towels made from HygroCotton extra absorbent. Like the sheets, they just get better and better over time, fluffing up when you wash and machine-dry them. And getting the new towels made me think about making bathroom essentials easy to access. Instead of a traditional nightstand, I found a small bookcase to use on one side of the guest bed. The middle shelf is the perfect spot for a couple towels AND the snacks I mentioned earlier! Linen closets are great, but if possible, find a way to store towels in plan view in the guest bathroom or bedroom. Some people aren’t comfortable digging through a closet. 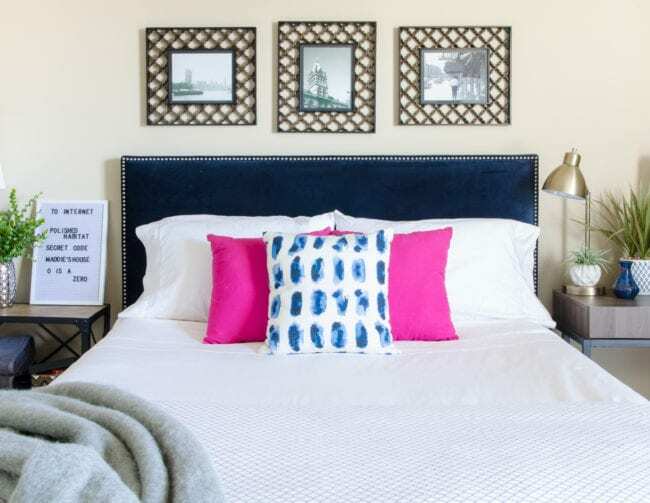 BONUS TIP: Adding a bench to the end of the bed gives your guest space to spread out their belongings and gather anything they need before heading to the shower. 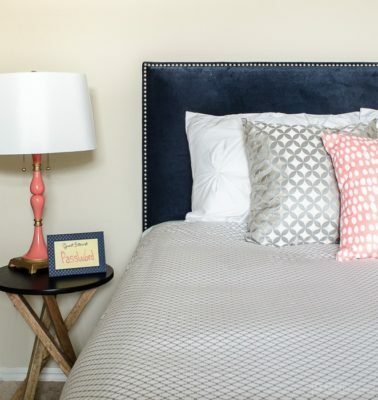 Spend a Night As a Guest – Sleeping in your own guest room once a year can go a long ways in helping you create a better space for others. There are things you just don’t think about unless you’re actually using the room. Perhaps you’ll realize you need thicker drapes for the morning sun, or a nice mattress pad to soften up a too-firm mattress. In our case, we realized that we needed to add a hamper upstairs for guest towels, which was another simple fix! I’m again amazed at what a difference we could make in this room using items gathered from around the house. The only new items were the sheets/towels, $10 letterboard, and $99 bookcase to use as the nightstand. 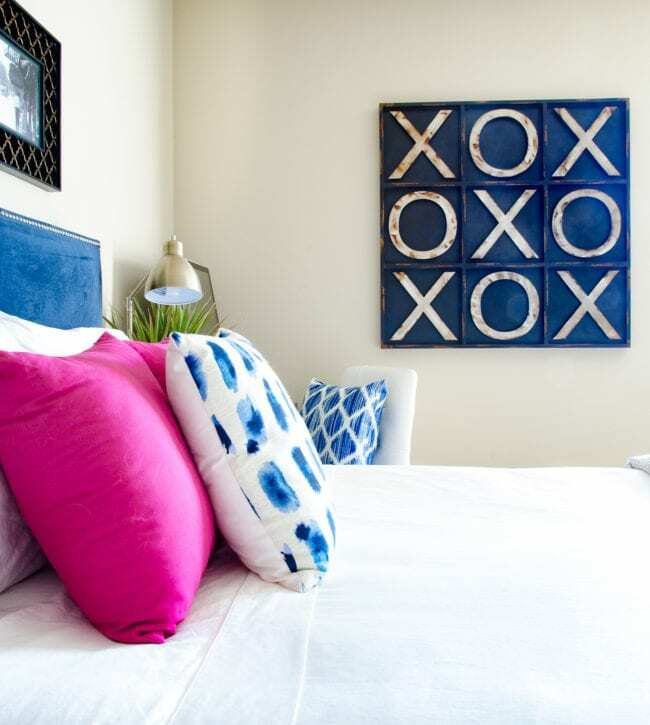 Hopefully, this inspires you to evaluate your guest room before the holidays! As a reminder, the sheets and towels made from HygroCotton can be found in retailers such as: Bed Bath & Beyond, Costco, Kohls, JC Penney, Walmart, Macy’s , Kmart and Sears. 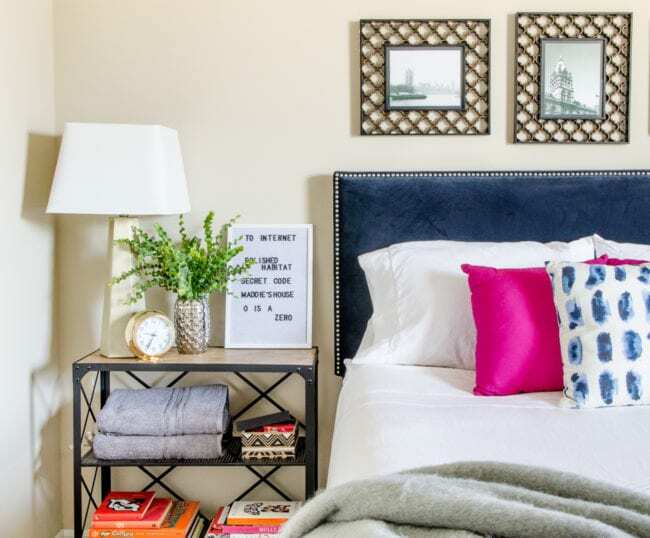 My new friends at HygroCotton put together a BIG sweepstakes so someone can tackle their own bedroom or guest room with the prizes. one (1) HygoSoft™ 300 TC White Queen Size Sheet Set (ARV of each prize: $629.98). The sweepstakes is being fully administered by Welspun and they will be randomly selecting the winners, notifying them, and are responsible for the prizes. This is a sponsored conversation written by me on behalf of Welspun. The opinions and text are all mine. I Would Love To WIN This!! I don’t have a Guest Room to decorate, but I would love this for Me!! GREAT GIVEAWAY Melissa, and I love the after picture you decorated. Simply Gorgeous!! Thank you, Jenny! It would be perfect for your bedroom too. Darn! Sorry about that – and kudos to you for skipping them and hopefully enjoying real life instead. Keep an eye out for future giveaways, most of the ones I host have an option to enter without social media. But I know that doesn’t help the disappointment for this one!